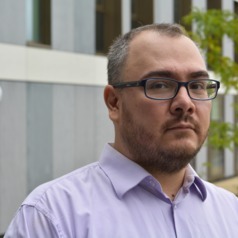 Carlos is a theoretical researcher in quantum technologies and lectures in cybersecurity and computer science at the University of Kent. His main area of work has been to further knowledge of the advantages and limitations that quantum theory conveys to communication, computation, metrology, and security. He has contributed to the fields of quantum computation, quantum imaging, quantum measurement devices, and more recently quantum cybersecurity. Carlos holds a PhD in quantum computing from the University of Waterloo in Canada. He is a former member of the Institute for Quantum Computing and the Perimeter Institute in Canada, as well as the Centre for Quantum Technologies in Singapore.